Diesel fuel systems were entirely mechanical until the mid-1980s, when manufacturers of vehicle engines turned to computers to give more precise control over fuel delivery and timing. Mechanical systems continue to be specified for many agricultural, construction, and marine applications. Early engines used compressed air to force fuel into the cylinders against compression pressure. Injectors received fuel from a low-pressure pump and air from a common manifold, which was pressurized to between 800 and 1000 psi. The engine camshaft opened the injectors, appropriately enough called "valves," to admit a blast of compressed air and atomized fuel to the cylinders. A throttling valve regulated engine speed by controlling the amount of fuel delivered; air required no metering, since surplus air is always present in diesel cylinders. Air injection had serious drawbacks. The air/fuel mixture could not penetrate deeply into cylinders that were themselves under 450-500 psi of compression pressure. Attempts to increase engine power by admitting more fuel merely dampened the flame. The compressors were parasitic loads that absorbed 15% and sometimes more of engine output. Nor did air injection make for a compact package: starting and four-stage air-injection compressors accounted for a third of the length 1914-era Krupp submarine engines. The need for more compact and silent submarine engines led the British arms maker Vickers to develop airless, or solid, injection. One can make the case that the ultimate consumers of nineteenth- and twentieth-century technology were enemy soldiers, sailors, and civilians. At any rate, solid injection was a vast improvement and, after the end of hostilities in 1919, was widely commercialized. 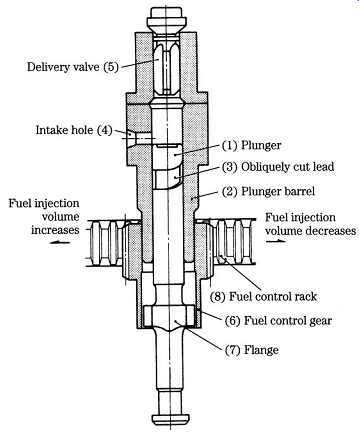 Injectors fed from a common rail that was filled with high-pressure fuel and usually fitted with an accumulator to smooth pressure variations generated by injector opening and closing ( FIG. 1). Adjustable wedges between the camshaft lobes and the injector followers permitted injection duration to vary with speed and load. Even so, this early form of c-r injection limited engine speed, since increasing the effective width of the wedge by forcing it deeper into contact with the cam also advanced the timing, causing the injector to open earlier. There were also maintenance concerns. According to contemporary accounts, the rails leaked and injectors dribbled fuel throughout the whole operating cycle. FIG. 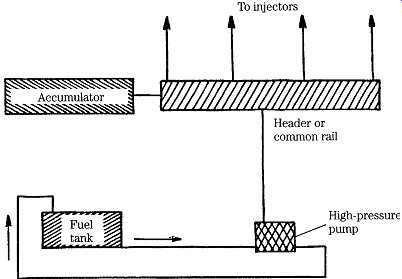 1 The common, or third-rail system supplied fuel to cam-operated injectors from a header, pressurized by a remote pump. By the late 1920s, c-r was being phased out by Bosch inline pumps, only to be revived again as the century closed. These new common-rail systems are discussed in the following section. The big breakthrough came with the development of the Bosch inline pump, used today in a form almost identical to the first production run of April, 1927. The first pumps were mated with pintle injectors for indirect injection (IDI) applications. Direct injection (DI) multiple-orifice injectors arrived in 1929 and, two years later, Bosch integrated centrifugal governors with the pumps. At this point, the modern diesel engine came into being. The inline pump consists of a row of individual plungers, one per engine cylinder, operated by the same internal camshaft. High-pressure tubing connects each of the plungers to its injector. The spring-loaded injectors function like pop-off valves to open automatically when a certain pressure threshold is reached. The sudden loss of line pres sure gave rise to the term "jerk pump," which while a bit inelegant, is descriptive. The distributor pump was developed in the early 1960s as a means of reducing the number of extremely precise and expensive plungers. One pumping unit, consisting of one, two, or sometimes three plungers, serves all injectors. After pressurization, the fuel passes through a rotary valve, known as a distributor head, for allocation to the individual injectors. A distributor pump is the hydraulic equivalent of an ignition distributor. Because of their relatively low cost, distributor pumps are standard ware for automobiles and light trucks. The major disadvantage is that the internal cam, which drives the plunger set, depends solely upon fuel for lubrication. Inline pumps lubricate the high-pressure cam faces with motor oil, either from an internal reservoir or from the engine oiling system. FIG. 2 illustrates the layout of the jerk-pump system that, in this example, employs an inline pump. A distributor-type pump could be substituted. 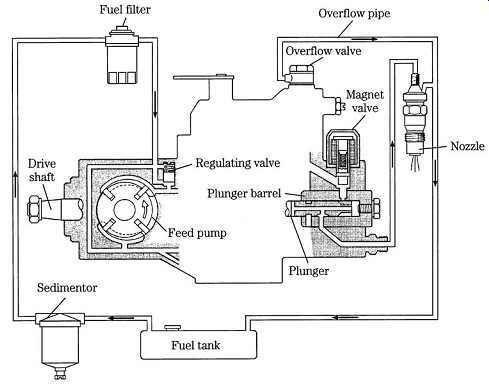 A lift pump, shown on the lower left of the drawing, delivers fuel to the filters and from there to the suction side of the inline pump. High-pressure fuel exits the pump through dedicated lines to each injector. A second line made up to each injector recycles surplus fuel back to the tank. The system works at three pressure levels: low pressure, on the order of 30-50 psi, between the lift pump and injector pump, pressure of several thousand psi in the injector piping, and slightly more than zero pressure on the return line. FIG. 2 An inline-pump system as used on Ford-based Lehman marine engines. The parts breakdown for a Bosch size A Series PE inline pump for six-cylinder engines is shown in FIG. 3. Shims (21 and 49) establish camshaft float. Two fuel delivery adjustments are provided. The basic setting is determined by the height of the adjustment bolts (35) that thread into the tops of each tappet. In addition, friction clamps (29) permit the control-sleeve pinions (30) to move relative to the rack to compensate for tooth wear and production tolerances. Fuel-delivery adjustments for this and all other injection pumps must be made on a test stand. The drawing of a single-plunger pump in FIG. 4 helps to clarify the relation ship between the rack, fuel control gear (plunger pinion), and plunger. Fuel enters through the intake port on the right and exits past the delivery valve at the top of the unit. The obliquely cut groove on the plunger outer diameter (OD) functions in conjunction with the rack to throttle fuel delivery. FIG. 3 Bosch Series PE pump. This example is found on six-cylinder Chrysler marine engines. FIG. 4 Plunger, barrel, and rack assembly. The relief labeled "obliquely cut lead" is generally called the "helix." How this is done is shown in FIG. 5. At the bottom of the stroke, the plunger uncovers the inlet port. Fuel enters the pressure chamber above the plunger. The plunger rises, initially pushing fuel back out the inlet port. Further movement masks the inlet port. The plunger continues to rise, building pressure on fuel trapped above it. The delivery valve opens, and a few milliseconds later, the injector discharges. Fuel continues to flow until the annular groove milled along the side of the plunger uncovers the inlet port. At this point, pressure bleeds back through the inlet port and injection ceases. Because of the shape of the groove, rotating the plunger opens the inlet port to pressure earlier or later in the plunger stroke. American Bosch, Robert Bosch, and CAV barrels are drilled with a second port above the inlet port to accept spillage during part-throttle operation. FIG. 6 illustrates the metering action of a CAV pump. Fuel enters the barrel at A and continues to flow until plunger movement masks the two ports (inlet shown on the left, spill port on the right). 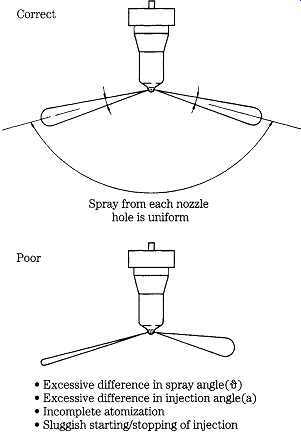 At full load, the pressure bleed-down through the spill port is delayed until the plunger approaches the end of its stroke, as shown in drawing C. You might wonder why the spill port opens before top dead center (tdc), when a few more degrees of cam movement would raise fuel pres sure even more. The reason is that cam-driven plungers behave like pistons, accelerating at mid-stroke and slowing as the dead centers are approached. Opening the spill port early, while plunger velocity and pressure rise are rapid, terminates injection far more abruptly than if the port remained closed until the plunger reached tdc. In drawing D, the annular groove has rotated to the half-load position. The effects of further rotation are shown at E, which represents idle, and at F, shutdown. However the porting is arranged, the effective stroke has a constant beginning and a variable ending for pumps this guide is concerned with. Some marine and large stationary engines meter fuel delivery at the beginning of the stroke. Details of the mechanism for transmitting rack movement to the plungers vary with the manufacturer, but always include an adjustment to equalize delivery between plunger assemblies. At a given rack position, each cylinder must receive the same amount of fuel. FIG. 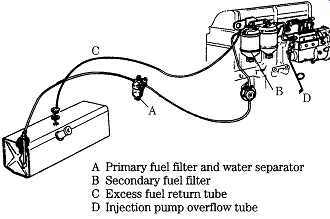 5 Constant-beginning, variable-ending plunger action with surplus fuel exiting through the inlet port. The main technical advantage of distributor pumps is that each cylinder receives precisely the same amount of fuel since all cylinders feed from the same plunger or plunger set. And, as pointed out above, reducing the number of plungers, which must be lapped to angstrom tolerances, reduces costs. FIG. 7 illustrates a CAV system for medium trucks. The engine-driven feed pump moves fuel from the tank to the filter and regulating valve. Fuel then passes to the transfer pump and, from there, to the inlet side of the distributor pump for pressurization and injection. 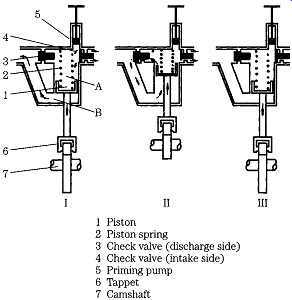 As explained below, the regulating valve throttles the injection pump during low-speed operation. Surplus fuel returns to the tank through low-pressure lines. 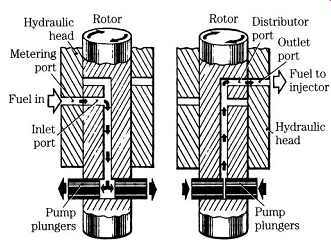 A pair of cam-driven plungers, mounted on the pump rotor and turning with it, generate injector pressure ( FIG. 8). During the inlet stroke the plungers move out ward under pressure from fuel entering through the inlet (or metering) port. As the rotor continues to turn, the inlet port is blanked off by the rotor body and one of the outlet ports is uncovered. As the outlet port is uncovered, the internal cam, acting through rollers, forces the plungers together. Fuel passes through the port for injection. Fuel that slips by the plungers returns to the filter. The amount of fuel delivered per plunger stroke is determined by the regulating valve (upper right in FIG. 7) that is controlled by the accelerator pedal and the centrifugal governor. At low engine speeds, the regulating valve limits the pressure of fuel going to the transfer pump and into the injection pump. Because the pump plungers are driven apart by incoming fuel, their outward displacement is determined by transfer-pump pressure. As engine speed and/or load increase, the regulating valve increases fuel pressure to force the pump plungers further apart. Unlike Bosch inline pumps, which throttle by varying the effective stroke, the Lucas/CAV unit varies the actual stroke. FIG. 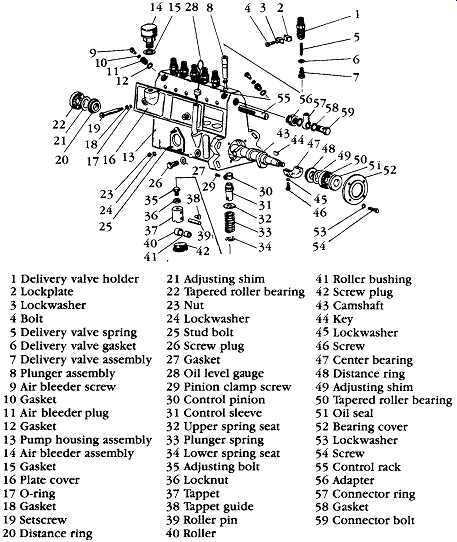 10 Bosch VE Series injection pump. FIG. 11 Cross-sectional view of the VE. Notice the integration and compactness of the design. Nearly 50 million VE pumps have been produced since introduction in 1975 with applications ranging from fishing boats to luxury automobiles. FIG. 9 sketches a basic installation, with filter, gravity-type water separator (sedimentor), fuel lines from the pump and injectors, and a solenoid-operated fuel shutoff (magnet) valve. Normally the fuel shutoff requires battery power to open; for marine applications the valve must be energized to close. This permits the engine to continue to run should the vessel lose electrical power. The VE turns at half engine speed and is geared to a mechanical (shown in FIG. 10) or electronic governor. The rear half of the pump houses the vane-type transfer pump and regulator that supplies the high-pressure section with fuel at pressures ranging from 40 psi to 175 psi at full throttle. Vane-pump pressure also controls the hydraulic timer that advances injection with increased engine speeds. A tongue-and-groove joint mates the rear half of the two-piece drive shaft with the forward, or plunger, half. This joint, which can be seen clearly in FIG. 11, permits the forward half of the shaft to move fore and aft as it rotates under the impetus of the face cam. The cam reacts against the housing through roller bearings, oriented as shown in FIG. 12. A control sleeve regulates the effective stroke of the plunger, which discharges through delivery valves on the distributor head. FIG. 13 Fuel overflow valve functions as an automatic bleeder, diverting air and surplus fuel back to tank. Marine Engine Div., Chrysler Corp. FIG. 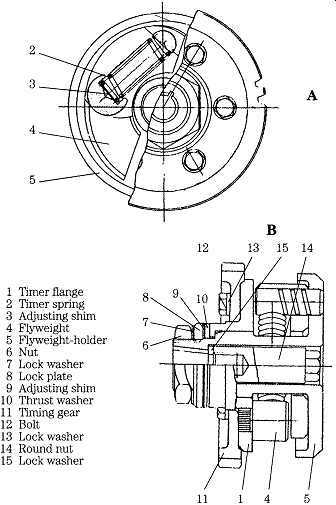 14 Timing marks on a Bosch distributor pump. Ford Motor Co.
Because surplus fuel recycles to the tank or filter through fuel overflow valves mounted at high points on pumps and injectors, a half-hour or so of operation is generally sufficient to purge the system of air bubbles ( FIG. 13). More serious air intrusions require bleeding, using procedures described in Section 4 for conventional, pre-computer engines and elaborated upon in Section 6 for more modern engines. 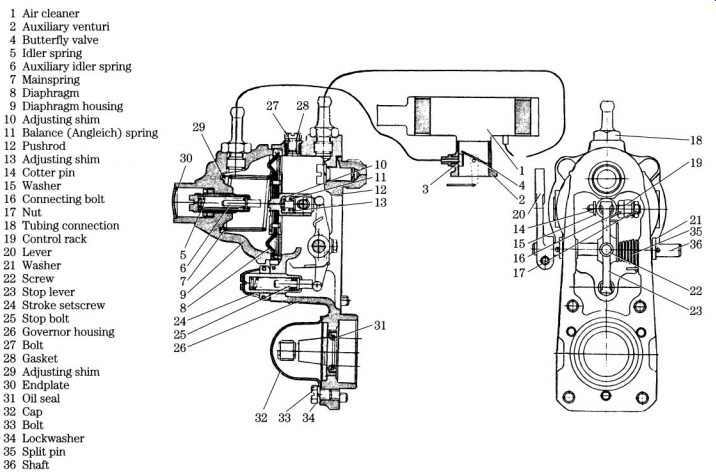 Injection pumps have two provisions for synchronizing fuel delivery with piston movement. Timing marks on the drive gears establish the basic relationship. Elongated mounting-bolt holes, which allow the pump body to be rotated a few degrees, provide the fine adjustment. Reference marks stamped on the pump body and mounting flange enable the adjustment to be replicated ( FIG. 14). Before removing a pump, bar the engine over until both valves on No. 1 cylinder close and the timing mark on the harmonic balancer or flywheel aligns with its pointer. This procedure indexes pump-gear timing marks for easy assembly. If the same pump is reinstalled, the reference marks on the pump body and flange should be valid. Substituting another pump puts the marks into question and the engine should be retimed, either statically or dynamically. 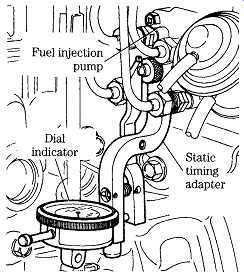 Static timing procedures vary enormously, but the purpose of the exercise is to synchronize the onset of fuel delivery with the piston in No. 1 cylinder. Depending upon engine make, model, and application, fuel should begin to flow anywhere from 8-22_ btdc as the flywheel is barred over by hand. Flywheels for small utility engines generally have two marks inscribed on their rims: one representing tdc and the other, always in advance of the first, indicating when fuel should begin to flow from No. 1 delivery valve. A convenient way to monitor fuel flow is to make up an adapter out of a length of clear plastic tubing and a delivery-valve fitting, as shown in FIG. 15. The mechanic slowly bars the engine over, while watching for the slightest rise in the fuel level. The onset of fuel movement should occur at the moment the timing mark aligns with its pointer. If tdc is passed and the plunger retreats, the flywheel must be turned back 15_ or so to absorb gear lash, and the operation repeated. Drive gears for Navistar (International) DT358 and its cousins have six timing marks. Which one to use depends upon the engine model and application. In a reversal of traditional practice, certain American Bosch pumps time to the end, rather than the onset, of fuel delivery. The delivery valve, which acts as a check valve, for No. 1 plunger must be disabled before timing. Timing specifications for distributor pumps are often expressed in thousandths of an inch of plunger movement from bdc. FIG. 16 illustrates the dial-indicator adapter that replaces the central bolt in the distributor head. Locating bdc-the precise moment when the plunger pauses at the bottom of its stroke-requires patience. Once bdc is found, the mechanic zeros the gauge and bars the engine over in the normal direction of rotation to the appropriate crankshaft or harmonic-balancer mark. He then rotates the pump body as necessary to match lift with the published specification. FIG. 16 For critical applications, plunger travel is measured with a dial indicator. Ford Motor Co. FIG. 17 Sun-timing light triggers from pulses in the fuel pipe. Dynamic timing, made with a strobe light while the engine ticks over at slow idle, compensates for pump-gear wear and other variables. It’s the only way that van and other inaccessible engines can be timed. The Sun timing light draws power from a wall outlet or, if equipped with an inverter, from the engine's 12-V or 24-V batteries ( FIG. 17). A transducer clamps over No. 1 fuel line to trigger the strobe when the injector opens and the sudden drop in fuel pressure contracts the line. The instrument also tracks how many crank shaft degrees the timing advances as engine speed increases. 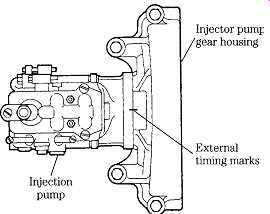 Unit injectors (UIs), which integrate the pump function with injection, are timed as described below. Other than periodically checking the oil level for in-line pump reservoirs and adding rust inhibitor to the fuel before long-term storage, injector pumps require no special attention. When loss of pressure indicates that the pump has failed, the mechanic farms the unit out to a specialist for cleaning or repair. While most mechanics would tackle Bosch VE, inline pumps are simple devices that can be opened for cleaning and elementary repairs. But the work requires patience and the highest possible levels of cleanliness. Plungers are lapped to their barrels and must be assembled as found. Nor should these sensitive parts be touched with bare fingers. Wear surgical gloves or use forceps. 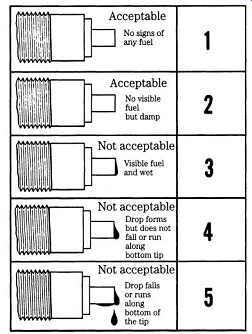 Tappets and other adjustable parts must be kept with their plungers. When disassembly entails loss of adjustment, the existing adjustments must be scribe marked. If at all possible, obtain a drawing of the pump before you begin. • Unscrew the delivery valves mounted above each barrel and lay them out in sequence on the bench, which should be covered with newspaper to reduce the possibility of contamination. • Most inline pumps incorporate a side cover for tappet access; others mount the individual plunger assemblies from above with studs. On those with side covers, rotate the camshaft to bring each tappet to the top of its stroke and shim the tappet. Withdraw the plungers from the top with the aid of a hooked wire or expansion forceps. Mark or otherwise identify the plungers for correct assembly. • Inspect the lapped surfaces with a magnifying glass. Deep scores or pronounced wear marks mean that the pump has come to the end of its useful life. Over-tightening the delivery valves warps the barrels and produces uneven wear patterns. Water or algae in the fuel leave a dull, satiny finish on the rubbing surfaces. Loss of the sharp edges on the helix profile upsets calibration. • A plunger should fall of its own weight when the barrel is held 45_ from vertical. Gummed or varnished plungers can make governor action erratic and accelerate wear on the helixes and rack. • If you have the specifications, check the cam profile with an accurate (i.e., recently recalibrated) micrometer. • Examine the rack teeth for wear. FIG. 18 illustrates, in exaggerated fashion, the wear pattern. The rack should move on its bushings with almost no perceptible side or vertical play. Installation of new bushings requires a factory reamer. Injectors feed through delivery valves mounted on the distributor head or above each barrel on inline pumps. These check valves open under pressure to supply fuel to the injectors and close automatically during the suction stroke. Most delivery valves consist of a conical sealing element shaped like an inverted top hat ( FIG. 19). The extension below the element, known as the piston, has two functions. It centers the valve over its seat and acts as a ram to force fuel back into the pump as the valve closes. This action assures a rapid drop in pressure so that the injector snaps shut without after-dribble. Delivery valves come in various shapes and sizes. Some replace the conical element with a disc, others hold a certain percentage of pressure in the downstream plumbing after closing. But all work on the same general principle. FIG. 21 Cross-section and exploded view of two CAV injectors. GM Bedford Diesel and Lehman Ford Diesel. 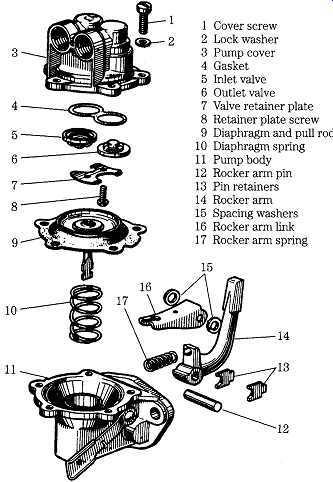 Delivery-valve problems are cylinder specific. If the valve sticks open, no fuel passes to the associated injector. Leakage is harder to diagnose. White smoke that persists after all bases have been touched-pump pressure and timing, new injectors, and engine compression-suggests that one or more delivery valves may be at fault. Disassemble one valve at a time, clean the parts thoroughly, and test for leaks by blowing through the outlet port. Older, simpler valves can sometimes be resurfaced. 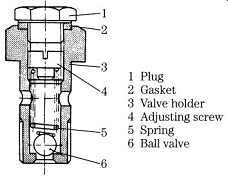 Check piston fit by depressing the valve and placing your finger over the inlet port ( FIG. 20). You should feel the vacuum as the piston falls. 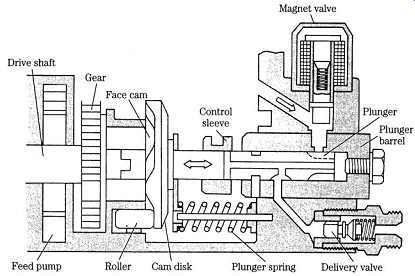 Mechanical injectors consist of two main parts-an injector body, or nozzle holder, and a needle ( FIG. 21). The injector body secures the assembly to the cylinder head, and includes connections for fuel inlet and return lines. 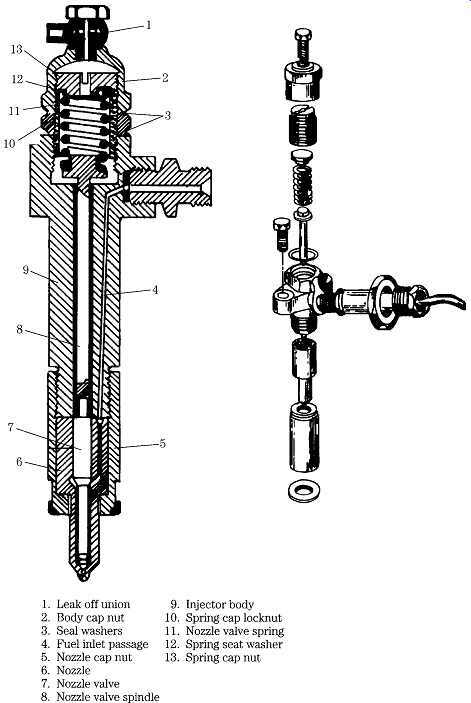 A spring-loaded needle ("nozzle valve") in the drawing, controls fuel flow through the injector. At NOP fuel pressure exerts sufficient force on the raised shoulder near the tip of the needle to overcome spring tension. The needle retracts clear of the orifice and injection commences. Once the needle lifts, its full cross-sectional area-the shoulder and tip-comes under fuel pressure. Consequently, less pressure is required to hold the needle open than to unseat it. This feature holds the nozzle open as fuel pressure drops in response to injection. When the pump plunger descends and the delivery valve closes, fuel pressure drops abruptly. The return spring forces the needle down to seal the orifice and injection ceases. The smaller the nozzle orifice, the finer the fuel spray and, all things equal, the less ignition lag. But if too small, the orifice limits engine output by restricting fuel flow. Multi-hole nozzles, some with a dozen or more, electrically discharge, machined orifices that satisfy both flow rate and atomization requirements, have become standard on DI engines. IDI engines employ pintle nozzles, two varieties of which are illustrated in FIG. 22. The pintle is an extension of the needle that, when retracted, produces a hollow, cone shaped spray. Because of the large diameter of the orifice and the shuttle action of the pintle, these nozzles are less susceptible to carbon buildup than multi-hole types. The throttling pintle introduces fuel in a staged sequence to reduce the sudden rise in pressure and heat during initial combustion. The pintle has a reduced diameter on the tip that, when seated, extends into the combustion chamber. Yanmar and most other manufacturers use a throttling pintle with the tip in the form of an inverted cone, shown on the right in FIG. 22. During the initial phase of injection, the cone lifts so that its base almost fills the orifice. At full lift the cone retracts clear of the orifice for maximum fuel delivery. FIG. 23 Ford-supplied injector tester. These tools have multiple uses, including testing common-rail fuel manifolds and HEUI oil galleries for leaks. • Discharge cleanly without "after-dribble," which tends to collect in the cylinder between cycles. • Atomize fuel for rapid combustion. • Direct the spray into the far reaches of the cylinder, but without impinging against the piston or chamber walls. Most malfunctions are caused by carbon buildup on the tip, which distorts the spray pattern and can sometimes stick the needle or pintle in the open position. 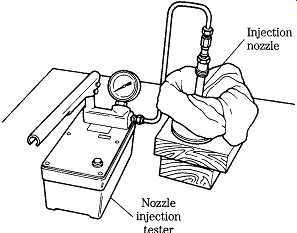 Automatic injectors can be tested with the apparatus shown in FIG. 23. Similar tests can be performed on unit injectors by loading the pump cavity with fuel and applying force to the pump plunger. WARNING: Wear eye protection and heavy gloves when testing injectors. Fuel spray can cause blindness and blood poisoning. There are four standard tests-spray pattern, NOP, sealing effectiveness, and chatter. Connect the tester as shown and, operating the pump lever in short, rapid strokes, observe the spray pattern. 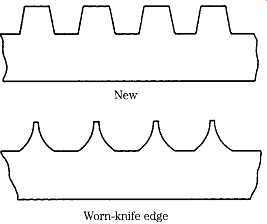 Pintle nozzles should produce a finely divided spray of uniform consistency and penetration ( FIG. 24). Multi-hole nozzles generate a wide, fan-like pattern ( FIG. 25). It can be helpful to direct the discharge against a piece of paper and compare the pattern to one produced by a new injector. Slowly depress the pump lever and note the peak gauge reading. Compare this pressure with the manufacturer's NOP specification. Some specifications are fairly broad, and engines may not idle properly unless NOPs cluster at one or the other end of the specification range. Most needle-return springs can be stiffened with shims. Dribble standards have become tighter in recent years. 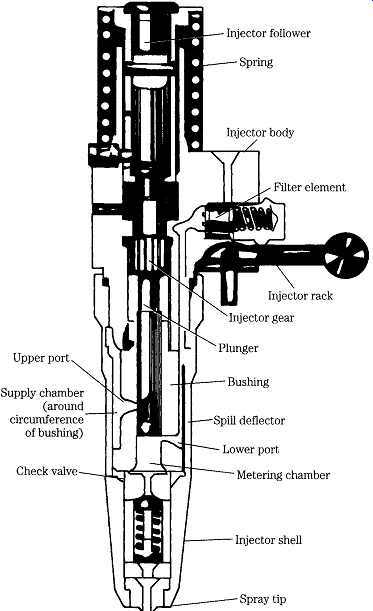 The pintle injector illustrated in FIG. 26 should remain fuel tight under 80% of NOP for at least 10 seconds. Note and correct any other source of leakage. 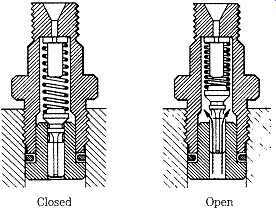 Injector opening is normally accompanied by a sharp "pop," which suggests that the needle retracts cleanly. Verify this action as the pump lever is cycled rapidly. However, leaking injectors can be made to chatter and some perfectly good throttling pintle injectors pop open, but refuse to chatter, no matter how adroitly the pump handle is worked. FIG. 24 Spray pattern diagnosis-modified pintle nozzle, IDI engines. 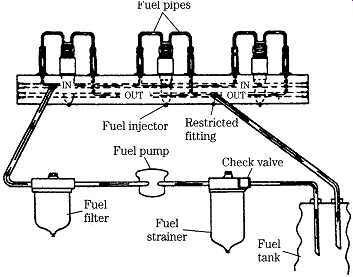 Moving fuel through an open injector requires time and, once injected, additional time is needed for the fuel to ignite. As engine speeds increase, less time is available to accommodate these delays, and the start of injection must occur earlier. The drawing back at FIG. 10 shows the VE hydraulic timer in cross-section. Pressure developed by the feed pump rises in an almost linear fashion with engine speed. As pressure increases, the piston moves to the right, compressing its return spring. A roller transfers this motion to the drive cam, turning it few degrees against direction of shaft rotation. Mechanical timers are similar to SI advance mechanisms, in that they employ centrifugal weights to sense engine speed and advance the cam ( FIG. 27). Spring tension on the weights determines the cut-in speed and shims fix the travel limit. To check timer operation, connect a timing light to an injector pipe and run the engine up to speed. Injection should advance smoothly without hesitation as the rack is extended. Specifications vary, but most applications require 5-7.5_ of total advance. FIG. 25 Spray pattern diagnosis-multi-hole nozzle, DI engines. Injector pumps often include a diaphragm-operated control that reduces fuel delivery at high altitudes and/or increases fuel at wide throttle angles for turbocharged applications. Diaphragms are tested with a vacuum gauge. FIG. 26 Dribble test-pintle nozzle, IDI engines. Spark-ignition engines have a built-in governor in the form of a throttle valve that, even wide open, limits the amount of air passing into the engine. Diesels have no such limitation, since surplus air is always available for combustion. 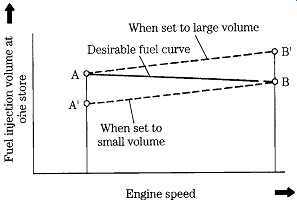 Engine speed depends solely upon the amount of fuel delivered. If the same volume of fuel necessary to cope with severe loads were delivered under no-load conditions, the engine would rev itself to destruction. Consequently, all diesel engines need some sort of speed-limiting governor. Most governors also control idle speed, a task that verges on the impossible for human operators. This is because the miniscule amount of fuel injected during idle exaggerates the effects of rack movement. Automotive applications are particularly critical in this regard. Idle speed must be adjusted for sudden loads, as when the air conditioner compressor cycles on and off, and when the driver turns the wheel and engages the power-steering pump. In addition to limiting no-load speed and regulating idle speed, many governors function over the whole rpm band. The operator sets the throttle to the desired speed and the governor adjusts fuel delivery to maintain that speed under load. The degree of speed stability varies with the application. No governor acts instantaneously-the engine slows under load before the governor can react. Course regulation holds speed changes to about 5% over and under the desired rpm, and is adequate for most applications. Fine regulation, of the kind demanded by AC generators, cuts the speed variation by half or less. Centrifugal governors sense engine speed with flyweights and throttle position with spring tension. FIG. 28 illustrates the principle: As engine speed increases, the spinning flyweights open to reduce fuel delivery. As the throttle is opened, the spring applies a restraining force on the flyweight mechanism to raise engine speed. So much for theory. In practice, centrifugal governors demonstrate a level of mechanical complexity that seems almost bizarre, in this era of digital electronics. But millions of these governors are in use and some discussion of repair seems appropriate. FIG. 27 Centrifugal fuel timer varies injection timing in response to changes in engine speed. Governor malfunctions-hunting, sticking, refusal to hold adjustments-can usually be traced to binding pivots. In some cases, removing the cover and giving the internal parts a thorough cleaning is all that's necessary. If more work is needed, the governor and pump should be put into the hands of a specialist. To appreciate why this is so, consider the matter of bushing replacement, which seems like a simple enough job. Using the CAV unit as a model, the critical bushings are those at the flywheel pivots (225 in FIG. 29) and the sliding bushing (231) on the governor sleeve. To remove and install the flyweights you will need CAV special tool 7044-8. Bushing press in, but factory reamers are needed to size them properly. And a governor with enough hours on it to wear out bushings will almost surely need recalibration, which can only be accomplished with a factory tooling that correlates piston stroke with rack position. FIG. 28 Bosch-type centrifugal governor. The flyweights react against throttle-spring tension to set the speed of the engine. As loads are encountered, the engine slows, the flyweights exert less force, and the spring extends the rack to restore engine rpm. Yanmar Diesel Engine Co., Ltd. FIG. 29 CAV governor in exploded view. Pneumatic, or flap valve, governors are less expensive than centrifugal governors and more amenable to repair. 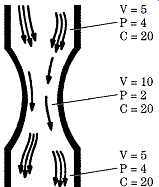 The velocity of air moving through the intake manifold is a function of piston speed. The faster the engine runs, the greater the velocity. Pneumatic governors sense this velocity as vacuum developed by a venturi mounted on the air intake. The venturi restricts the flow of air and, so doing, reduces its pressure. This relation ship has a constant of 20, as shown in FIG. 30. If we use consistent terms and multiply pressure times velocity at any point in the venturi, the answer is always 20, or something approximating that number. Nor need the venturi be the sort of streamlined restriction shown in the drawing; any impediment accelerates air flow and reduces its pressure. 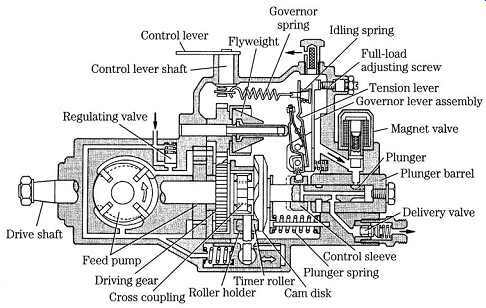 Pneumatic governors, while by no means the state of the art, are still encountered on marine and industrial engines. The example discussed below is one of the most complex. FIG. 30 The venturi constant. This unit, shown in cross-section in FIG. 31, uses a flap, or butterfly, valve (4) as a variable venturi. A tube bleeds vacuum from the edge of the valve to the left or low pressure side of the diaphragm housing. A second tube brings filtered air at atmospheric pressure to the right side of the housing. The spring-loaded diaphragm (8) separates these two halves of the housing and connects to the fuel rack. The flap valve is free to pivot in response to incoming air velocity. At low engine speeds the valve positions itself as shown in the drawing. All air entering the engine must accelerate and squeeze past the obstruction created by the edge of the valve and the vacuum-line connection. The diaphragm responds to the resulting depression by moving toward the left, or low-pressure, side of the housing. Fuel delivery is reduced. If the engine decelerates as when encountering a load, vacuum drops and the diaphragm shifts toward the right to increase fuel flow. FIG. 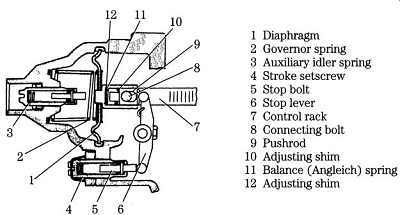 31 MZ centrifugal governor. At wide-open throttle, the velocity of incoming air pivots the flap valve full open. Sensing the low level of vacuum, the diaphragm shifts to the right, extending the rack. The governor also includes the mechanism shown in FIG. 32 that reduces fuel delivery at idle. As the diaphragm moves to its extreme leftward position, it brings the stop lever (6) to bear against the stop bolt (5). This action compresses the balance spring (11) and displaces the rack (7) toward the no-fuel position. As engine speed increases, the diaphragm moves to the right. The balance spring mechanism moves with it, away from the stop lever. Once clear of the lever, the spring has nothing to react against and is out of the circuit. The leather diaphragm should hold 500 mm/H2O of vacuum with a leak-down rate of no more than 2 mm/sec. It should be flexible enough to collapse of its own weight when held by the rim. Nissan dealers can supply the special diaphragm oil required to soften the leather. A screw under the circular end cover reacts with the auxiliary idle spring (3) to set the idle speed. Tightening the screw moves the rack to the right to increase fuel delivery and idle rpm. But the effect extends to all engine speeds ( FIG. 33). Fuel delivery for best idle over-fuels the engine at high speed and, conversely, a setting that gives best fuel economy at speed, costs low-end power. The adjustment is a compromise. Other adjustments require a test fixture available to dealer mechanics. For example, the stroke adjustment, shown at 4 in FIG. 32, is made to factory specifications with the diaphragm chamber evacuated and the pump turning 500 rpm. To further complicate matters, balance-spring adjustment must be done by comparing its action with a known good unit. FIG. 32 MZ balance mechanism. 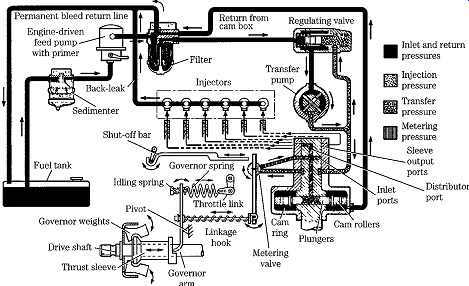 Thus far, we have discussed three types of mechanical fuel systems: air blast, early common-rail, and jerk pump. The last of these systems, and in some ways the most attractive, is unit injection. Unit injection combines the pumping function with injection. That is, each UI incorporates its own high-pressure pump driven from the engine camshaft. Injection pressures, often in excess of 20,000 psi, are confined entirely within the injector bodies. The lines that connect the lift pump with the injectors see only moderate pressures, on the order of 50 psi. Consequently, UI systems are virtually leak-proof. Mechanics, at least the ones old enough to remember first-generation Volkswagens and Detroit Diesel two-strokes, like the way UIs localize problems. When a UI fails, only the associated cylinder goes out. And because an engine will run with one or two bad injectors, it becomes its own test stand. FIG. 34 illustrates the standard Detroit Diesel fueling circuit. The restrictor draws off a portion of the incoming fuel to cool the injectors before returning to the tank. Two stages of filtering are provided, with the primary filter on the suction side of the fuel pump. FIG. 33 MZ injection curves. FIG. 35 Cutaway of a Detroit unit injector. 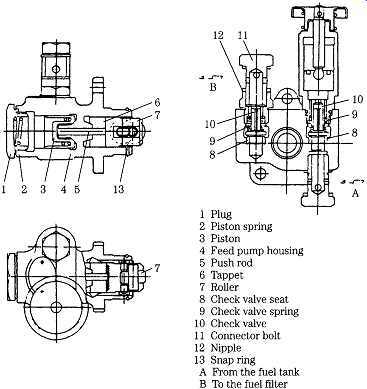 In addition to the parts found on more conventional injectors, a UI has a mushroom shaped cam follower, return spring, pump plunger, fuel-supply chamber, and one or more check valves ( FIG. 35). The rack controls fuel delivery by rotating the plunger as described under "Inline pumps." Fuel enters the injector and passes to the supply chamber. As the engine cam forces the plunger down, fuel trapped in the supply chamber comes under increasing pressure. At NOP, the needle valve lifts and injection begins. The disc-shaped check valve is fail-safe. Should needle fail to seat, the check valve closes to prevent air from entering the fuel supply. Other than changing out plunger-related parts, unit injectors are not normally considered field-repairable. Regardless of the type of high-pressure system, all engines employ similar low pressure systems. A fuel supply, feed, transfer, or lift (the terms are interchangeable) pump sup plies low-pressure fuel to the suction side of the injector pump or unit injectors. Most lift pumps are driven mechanically, although in recent years, electric drive has become popular. Pressure varies with 50 psi as a ballpark figure. Stanadyne, Lucas/CAV and Bosch distributor-type injector pumps employ an integral vane-type lift pump as pictured back in FIG. 9 and subsequent drawings. The sliding vanes rotate in an eccentric housing with the outlet port on the periphery. Gear-type lift pumps, similar to lube-oil pumps, develop pressure from the tooth mesh and usually incorporate a spring-loaded pressure-limiting valve. Chrysler-Nissan SD22 and SD33 engines feed through a piston pump driven off the injector pump ( FIG. 36). The operation of the pump is slightly unorthodox, in that fuel is present on both sides of the piston to eliminate air locks. As the piston retracts, fuel under it’s expelled and the inlet check valve opens to admit fuel into the chamber above the piston ( FIG. 37). As the piston rises, the check valve closes to permit the upper chamber to be pressurized. Fuel under the piston then reverses course to fill the void left by the rising piston. Near tdc the spring-loaded discharge side valve opens. Spring tension determines pump pressure. The upper chamber can also be pressurized manually to bleed the system. Small engines are often fitted with low-pressure diaphragm pumps such as the AC unit pictured in FIG. 38. The pump consists of a spring-loaded diaphragm activated by the engine camshaft. Inlet- and discharge-side check valves are often interchangeable. Loss of pressure is the definitive symptom of pump failure, although it would be helpful if manufacturers provided output volume specifications. 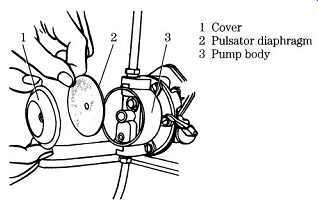 Before condemning the pump, check for air leaks as described in the previous section. A length of transparent plastic tubing spiced into the pump output line will reveal the presence of air bubbles. Pump vanes wear in normal service and can stick in their grooves when the fuel turns resinous after an extended shutdown. Gear-type pumps should require no routine maintenance other than inspection during the course of engine overhaul. Wear tends to localize on the pump cover. When pump failure, as from a sheared drive gear, is suspected, it’s sometimes possible to establish that the gears turn by inserting a fine wire into the outlet and cranking the engine. The wire should vibrate from contact with the spinning gears. FIG. 37 Operation of the unit shown in the previous illustration. Marine Engine Div., Chrysler Corp. FIG. 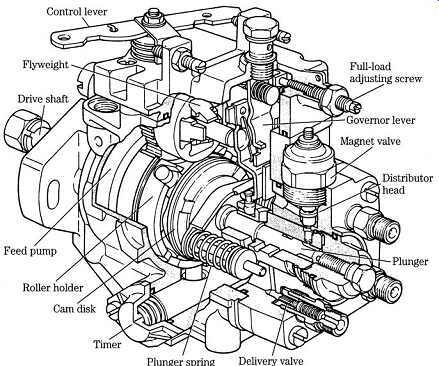 36 Piston-type Chrysler-Nissan lift pump. Check valves are the weak point of reciprocating (piston or diaphragm) pumps. Most check valves can be removed for cleaning or replacement. When this is not possible, a piece of wire inserted into the fuel entry port should unstick the ball, at least temporarily. Diaphragms should be changed periodically and the housing cleaned every 200 hours or so of operation ( FIG. 39). When installing these pumps, it’s good practice to bar the engine over so the pump lever rides on the lower part of the cam. FIG. 38 AC diaphragm-type lift pump used on Bedford trucks. Most engines incorporate three stages of filtration-a screen at the tank and paper-element primary and secondary filters. Filters are rated by the size of particle trapped: a typical installation would employ a 30-micron primary filter and a secondary of between 10 and 2 microns. 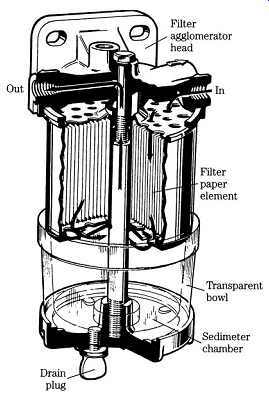 A water separator is often built into the primary filter ( FIG. 40), which also may include a connection for fuel return and an electric heater to prevent fuel gelling and waxing in cold climates. When a filter element is changed, entrapped air must be bled as described in Section 4.